This testimony was written by blogger and human rights advocate Befeqadu Hailu in late August 2014. 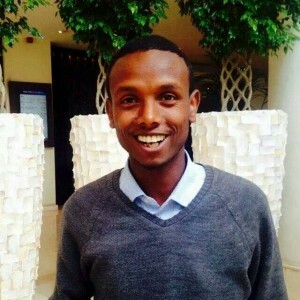 A founding member of the Zone9 blogging collective and a Global Voices community member, he was arrested and imprisoned on April 25, 2014 along with five fellow members of Zone9 and three journalist colleagues. On July 17, 2014, all nine detainees were charged under the country’s penal code and the Terrorism Proclamation of 2009. Befeqadu mentions in his text the names of several of his fellow detainees including Abel, Mahlet, and Natnael. All are members of the Zone9 collective. This is the first of two installments of an abridged version of Befeqadu’s testimony. It was translated from Amharic to English by Endalk Chala and edited for clarity and context by Ellery Roberts Biddle. The second installment is here. The full, unabridged testimony is available in PDF form here. Befeqadu Hailu. Photo used with permission. The next step is “due process” and our prosecution, but I believe there are still questions to be answered. How did we get here? What was our interrogation like? Are we really members of Ginbot7/May15? If not, why have they arrested us? Will they release us soon? Zone9 was merely two weeks old when the government made our collective blog inaccessible in Ethiopia in 2012. Despite the blockage, we continued to write, but we knew that the fate of our blocked blogs could be our own. We knew we could end up being arrested. In the days and weeks leading up to our incarceration in April 2014, government security agents threatened us with imminent arrest, but we were still shaken by what happened to us. The six local members of the blogging collective and our three journalist allies were arrested and detained. With the exception of one of the journalists (Asmamaw Hailegiorgis of Addis Guday newspaper) we were arrested on Friday April 25 at about 11:00 pm and taken from our respective locations. Asmamaw was arrested the next morning. By the time we were seized and taken to the detention center, the search “warrant” that authorized our arrest was well over its time limit, according to Ethiopian law. The unlawful intrusion on our rights began here. Without delay, we became the victims of many violations of Ethiopian law by the authorities. This is the first of two installments of an abridged version of Befeqadu’s testimony. It was translated from Amharic to English by Endalk Chala and edited for clarity and context by Ellery Roberts Biddle. The full, unabridged testimony is available in PDF form here. Learn more about the case Zone9 Bloggers’ case at the Trial Tracker Blog. Ginbot7 and the Oromo Liberation Front (OLF) are opposition political parties based in the United States. Both have been accused of terrorism by the Ethiopian government. “Addis Ababa’s Kality prison is divided into eight different zones, the last of which — Zone Eight — is dedicated to journalists, human right activists and dissidents. When we came together, we decided to create a blog for the proverbial prison in which all Ethiopians live: this is Zone Nine.” From “Six Members of Blogging Collective Arrested in Ethiopia,” by Endalk Chala. “They Want a Confession” documents serious human rights abuses, unlawful interrogation tactics, and poor detention conditions in Addis Ababa’s Maekelawi detention center, drawing from interviews with former Maekelawi detainees and their family members. Those detained in Maekelawi include scores of opposition politicians, journalists, protest organizers, and alleged supporters of ethnic insurgencies. Full report here. Pingback: Global Voices Community Blog » Bloggers Shrink the Planet – GV on the news in 2006!